What Is the Cause of Smallpox? What Are Smallpox Risk Factors? What Is the Contagious Period for Smallpox? What Is the Smallpox Incubation Period? What Are Signs and Symptoms of Smallpox? What Tests Do Physicians Use to Diagnose Smallpox? What Are Treatments for Smallpox? Are There Home Remedies for Smallpox? Is There a Vaccine to Prevent Smallpox? What Are Potential Complications of Smallpox? What Is the Prognosis of Smallpox? Smallpox is a disease caused by a poxvirus that is transmitted from person to person that causes high fever, characteristic rash, and may kill about one-third of those infected. Smallpox (also called variola) is the only disease that has been completely wiped out throughout the world. Smallpox is also potentially one of the most devastating biological weapons ever conceived. Due to the success of an intense worldwide public health initiative, not one documented naturally occurring case of this highly infectious, deadly disease has occurred since Oct. 26, 1977. 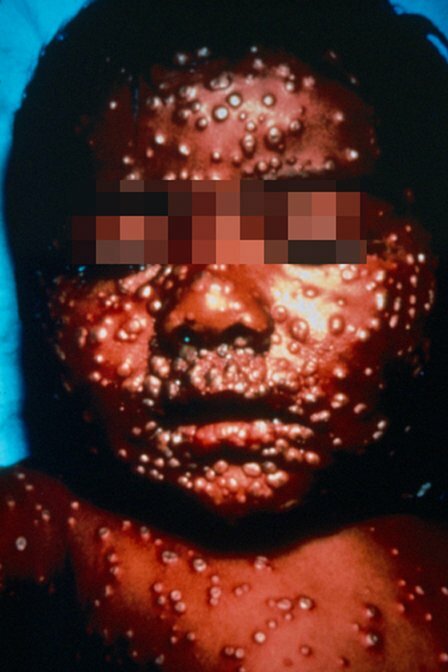 (An unvaccinated hospital cook in Somalia was the last person to naturally contract smallpox.) The World Health Organization (WHO) officially declared smallpox eradicated in 1980. At that time, all remaining collected supplies of the smallpox virus were supposed to be destroyed or sequestered in two laboratories, one in the United States and one in Russia. Geopolitical events in the last decade and revelations concerning offensive biological warfare programs by certain foreign governments have raised concern that this virus may have fallen into the hands of other foreign states who might seek to use the virus as a biological weapon. History of smallpox: For centuries, smallpox affected political and social agendas. Evidence of smallpox infection has been found in Egyptian mummies. Smallpox epidemics plagued Europe and Asia until 1796, when Edward Jenner tested his theory of disease protection. He did this by inoculating a young boy with material obtained from a milkmaid who was infected with the milder cowpox virus. The success of that experiment led to the development of a vaccine (from vacca, the Latin word for cow). Afterward, the incidence of smallpox infection in Europe steadily declined. In the Americas, smallpox severely weakened the native population. They had never been exposed to smallpox, which the European explorers brought with them to the Americas in the 1600s. The British forces at Fort Pitt (later to become Pittsburgh, Pa.) purposefully gave smallpox-contaminated blankets and goods to Native Americans during the French and Indian Wars in an attempt to weaken the Native American resistance to colonial expansion. Due to this and through natural spread, the epidemic that followed killed half of the Native American population. Once the disease and its method of spread were understood more thoroughly, smallpox vaccination became mandatory in developed countries in the early 1900s. The development of the vaccinia virus, coupled with aggressive immunization, led to the eventual control and eradication of smallpox in 1977. Since the last documented "naturally occurring" case in 1977, only two deaths from smallpox have been reported (1978 in Birmingham, England). Both deaths were the result of laboratory accidents. Current locations of smallpox virus: Only two laboratories in the world are known to house smallpox virus: the Centers for Disease Control and Prevention (CDC) in Atlanta, Ga., and the State Research Center of Virology and Biotechnology in Koltsovo, Russia. Various sources from the Soviet Union allege the Russian military had pursued and currently pursues an active biological warfare program. In 1992, Russian President Boris Yeltsin confirmed a suspected outbreak from an accidental release of aerosolized anthrax (anthrax stored in a container that allows it to be released into the air) near a military microbiology laboratory in 1979. Dr. Ken Alibek, a former senior microbiologist in the Russian Offensive Biological Weapons Program, has alleged that, in 1980, the Soviet Union started large-scale production of the smallpox virus and genetic recombination of more potent strains. Since the fall of the Soviet Union, concern exists that this knowledge may be used in other countries. The extent of smallpox stockpiles in other countries is unknown but may have become substantial since the collapse of the Soviet Union. The consequences of a smallpox outbreak can only be estimated. About 30% of unprotected people who are exposed to a person with smallpox would themselves become infected. Of these, 30% would probably die from infection. Diagnosis is difficult during early stages of the disease. Presently, insufficient supplies of vaccine exist to ensure eradication of smallpox in case the disease is released intentionally in a large-scale attack. Are previous vaccinations still protective? Routine vaccination of the general population in the United States stopped after 1980. Vaccination of military personnel was discontinued in 1989. Researchers estimate that vaccinated people retain immunity for about 10 years, although the duration has never been fully evaluated. Therefore, the current population in the United States is considered vulnerable to smallpox. Almost half of the U.S. population is younger than 30 years of age and has never been vaccinated. The ease of production and aerosolization of the virus is well documented. Researchers estimate that only 10-100 virus particles are necessary to infect someone. Thus, weaponized smallpox is a potential biological weapon of staggering danger. Variola (the virus that causes smallpox) is a member of the orthopoxvirus genus, which also includes viruses that cause cowpox, monkeypox, orf, and molluscum contagiosum. Poxviruses are the largest animal viruses, visible with a light microscope. They are larger than some bacteria and contain double-stranded DNA. Poxviruses are the only viruses that do not need a cell's nucleus to replicate inside the cell. The variola virus is the only known cause of smallpox. The disease affects only humans. No animal reservoirs or insect vectors (insects that spread a disease) exist, and no carrier state (period when the virus is in the body, but the person is not actively sick) occurs. Before smallpox was wiped out, the disease survived through continual person-to-person transmission. Pregnant women and children had a heightened risk for the illness. Smallpox also affected them more severely than normal. The virus is only transmitted from human to human; there are no known animal infections. The virus is acquired from inhalation (breathing into the lungs). Virus particles can remain on such items as clothing, bedding, and surfaces for up to one week. The virus starts in the lungs. From there, the virus invades the bloodstream and spreads to the skin, intestines, lungs, kidneys, and brain. The virus activity in the skin cells creates a rash that starts as macules (flat, red lesions). After this, vesicles (raised blisters) form. Then, pustules (pus-filled pimples) appear about 12-17 days after a person becomes infected. Survivors of smallpox often have severely deformed skin from the pustules. Types: Variola major, or smallpox, has a death rate of 30%. Variola minor, or alastrim, is a milder form of the virus with a death rate of 1%. Four types of variola exist: classic, hemorrhagic, malignant, and modified. Classic smallpox is believed to be the most communicable disease; about a third of unvaccinated people who come in contact with it become infected. The hemorrhagic variety of variola has a much higher death rate than classic smallpox and leads to death more quickly. Infected people often die before the pustules form. This variety is recognizable by certain types of bleeding sores in mucous tissues. Pregnant women are more likely to contract this version. Prior to eradication, the malignant or flat form of smallpox affected 6% of the population and evolved more slowly than the classic type. Lesions were flat, often described as feeling velvety. The death rate for this form approaches 100%. The modified variety of smallpox essentially affects people who have been vaccinated and still have some immune response to the vaccine. In a vaccinated population, this version could affect about 15%. Because smallpox has been eradicated, the only risk factor today for contracting the virus is working in a laboratory with the virus or in the event of a biological weapons attack. In the past, risk factors for smallpox included contact with a person with smallpox, contact with infected bodily fluids or contaminated surfaces, or exposure to aerosolized particles (such as from a cough or sneeze) from a person with smallpox. Smallpox is highly contagious and mainly spreads from person to person by inhalation. However, infectious smallpox virus particles can remain viable on surfaces, clothing, and bedding for up to one week. Once the initial symptoms of smallpox appear (high fever, malaise, headache and body aches, and vomiting), people may start to be contagious. This is called the prodrome phase, and it can last from two to four days. The most contagious period is once the rash develops, and this can last from seven to 10 days following the onset of the rash. After exposure to the smallpox virus, the incubation period averages about 12-14 days, but the range can be from seven to 17 days. During this time, people usually do not have any symptoms and are not contagious. After infection, symptoms may take from seven to 17 days to appear for major types of smallpox. The virus begins growing in the bloodstream 72-96 hours after infection, but no obvious symptoms appear immediately (see multimedia files below for clinical presentations of smallpox infections). People who have contracted smallpox initially develop such symptoms as fever, body aches, headache, chills, malaise, muscle aches, and particularly backache. Over half of people with smallpox experience chills and vomiting. Some become confused. A rash appears 48-72 hours after the initial symptoms and turns into virus-filled sores, which later scab over. The process can take up to two weeks. Just after the rash appears, the virus is highly contagious as it moves into the mucous membranes. The body sheds the cells, and virus particles are released, coughed, or sneezed into the environment. The infected person can be infectious for up to three weeks (until the scabs fall off the rash). Live virus can be present in the scabs. After the scabs or crusts fall off (in two to four weeks), a depression or light-skinned scar remains. Early in the course of the disease, the rash and pus-filled sores can look like and easily be mistaken for chickenpox. Lesions occur first in the mouth and spread to the face, then to the forearms and hands, and finally to the lower limbs and trunk. In contrast, rashes from chickenpox progresses from the arms and legs to the trunk and rarely forms in the armpits, palms, soles, and elbow areas. A person may initially see a primary-care provider (PCP) such as a family practitioner, internist, or child's pediatrician, or an emergency-medicine specialist in a hospital's emergency department, but infectious-disease specialists must be consulted, along with state, federal, and local health authorities. Initial diagnosis of smallpox is most likely based on a history and physical examination findings; any person suspected of having the disease needs to be isolated, people caring for the patient should use strict isolation-barrier techniques to protect themselves and others from exposure and local, state and national health authorities should be informed immediately. Other procedures (quarantine and vaccinations of people who contacted the patient) will be done if smallpox is diagnosed (see below). The doctor may take a throat swab to make the diagnosis of smallpox. Tests include taking a sample from a freshly opened pustule, which may be useful in diagnosis. For suspected cases of hemorrhagic smallpox, the doctor may sample fluid from a spinal tap (lumbar puncture). Under certain conditions, cytoplasmic inclusion bodies (also known as Guarnieri bodies) may be visible within the cells. This is also evidence of smallpox infection. Technicians isolate the variola virus in labs with only the highest biosafety levels (Biosafety level IV). The CDC in Atlanta and the U.S. Army Medical Research Institute of Infectious Diseases (USAMRIID) at Ft. Detrick, Md., are the only laboratories in the U.S. with these capabilities right now. The doctor sends the possible smallpox sample using special means. Viral cultures, polymerase chain reaction (PCR), and/or enzyme-linked immunoabsorbent assay (ELISA) may be undertaken to make a definitive diagnosis once the sample arrives as the lab. Even one case of smallpox is considered an international public health emergency, and public health officials must be notified of a possible case of smallpox immediately. In the hospital's emergency department, a suspected smallpox victim is isolated. All emergency medical services and hospital personnel exposed to someone with smallpox require quarantine and vaccination if they have not been previously vaccinated against smallpox. Isolation: The infected person is immediately placed into strict isolation (as opposed to quarantine, which is used for healthy, asymptomatic people who may have been exposed to the infected person). Quarantine: Anyone who has come into contact with the infected person for up to 17 days prior to the onset of that infected person's illness (including the treating doctor and nursing staff) may be required to remain in quarantine until a definite diagnosis is made. If the suspected case is indeed smallpox, these individuals will have to remain in quarantine for at least 17 days to ensure that they are not also infected with the virus. If a person in quarantine develops the signs and symptoms of smallpox infection, they are immediately moved to strict isolation. The most likely scenario of a smallpox outbreak is from a terrorist attack or a laboratory accident. Given the highly infectious nature of the organism, researchers estimate that one infected person can infect up to 20 new contacts during the infectious stage of the illness. If one infected person appears at a hospital, it is assumed that more people have been infected. Because of the medical, legal, and social implications of quarantine and isolation, coordinated involvement at the federal, state, and local levels is mandatory. In reality, strict quarantine of a large segment of the population is probably not possible. Infectious disease specialists are consulted, along with state, federal, and local health authorities. Treatment: Medical treatment for smallpox eases its symptoms. This includes replacing fluid lost from fever and skin breakdown. Antibiotics may be needed for secondary skin infections. The infected person is kept in isolation for 17 days or until the scabs fall off. Experiments testing new antiviral medications are in progress, but it will be some time before they produce results. Vaccinations and postexposure interventions are the mainstays of treatment. There are no home remedies for smallpox. It is highly contagious and can be fatal. Medical treatment and isolation is required. Vaccination is the most effective means of preventing smallpox infection. Vaccination can even be administered up to four or five days after a person is exposed to the virus and is the only known way to prevent smallpox in an exposed person. If the vaccine is given within four days postexposure, it can prevent or lessen the severity of the symptoms. Even vaccination up to seven days postexposure may give some protection from smallpox and result in a significantly less severe case of the illness. How the vaccination is given: The inoculation is injected with a special two-pronged needle dipped into the vaccine solution. The needle is then used to prick the skin (usually of the upper arm) 15 times. Smallpox vaccine side effects include soreness at the pricked spot. The glands in the armpits may become swollen, and the person may have a low-grade fever. A red, itchy bump develops in three to four days, becomes a pus-filled blister, and begins to drain. During the second week, the blister dries up, and the scab that forms eventually falls off, leaving a small vaccine scar. The vaccination site should be kept covered with a bandage, and the person with the sore should not touch it. Less than 1% of people have serious reactions to the vaccine. The smallpox vaccine is made from vaccinia, a virus related to, but different from, smallpox. Reports vary concerning the number of existing smallpox vaccine doses in the U.S. and abroad. Studies are under way to determine how much a vaccine dose can be diluted without compromising its effectiveness. The Department of Health and Human Services' goal is to have one dose for every American in case of a bioterrorism attack. Until then, the executive branch of the federal government, via the CDC, decides who is vaccinated. The state health departments also have access to limited local stock. Reports also vary concerning the World Health Organization's current storage of smallpox vaccine. The smallpox vaccine and vaccinia immune globulin (VIG) are available only through the CDC and state health agencies. The calf lymph vaccine is the only one still available although a replacement vaccinia vaccine produced from cell cultures is under development. Currently, the only licensed smallpox vaccine is Dryvax. However, several other vaccines are being assessed in clinical trials. The National Institute of Allergy and Infectious Disease has awarded two contracts to Acambis, Inc., to develop, test, and supply the U.S. with enough doses of smallpox vaccine to manage a potential outbreak in case of smallpox bioterrorism. Some studies on the existing American vaccine stockpiles indicate that the vaccine would be effective in dilutions of 1:10. However, the occurrence of the "take," a small scab that forms when a vaccination is successful, would be insufficient at this dilution to ensure eradication among an infected population. Further studies at 1:5 dilution are in progress. The FDA approved the newer Acambis-Sanofi vaccine (ACAM 2000) in 2008 to replace Dryvax. The U.S. government is unlikely to restart a smallpox vaccination program anytime soon, even after obtaining enough vaccine to immunize everyone in the country. This is because the vaccine itself is dangerous to people with immunological disorders, such as HIV, or other immunocompromising conditions, such as certain forms of cancer. The smallpox vaccine actually contains live viral particles of vaccinia, a virus similar to smallpox. This virus usually does not cause disease in humans. However, vaccination with this vaccine could prove deadly in a person with an impaired immunity because the virus is allowed to spread uncontrolled throughout the body. No one with a weakened immune system should receive the vaccine. People with the skin conditions such as eczema or atopic dermatitis should not have the vaccination because of the risk of rare but life-threatening reactions. Most vaccine experts would only recommend a large-scale vaccination program if smallpox were released into the general population as a biological weapon. Vaccination of first responders to a smallpox outbreak has begun. President Bush received the vaccinia protection against smallpox in support of the U.S. troops receiving theirs. Researchers estimate that of the previously vaccinated population, many probably retain some varying degree of residual immunity. This means that if an outbreak were to occur, some people vaccinated years ago, if exposed to smallpox, may respond by developing full-blown disease, mild disease, or no disease. How many years it has been since a person's last vaccination and, possibly, the total number of vaccinations an individual has received may determine that person's reaction to exposure to smallpox. Smallpox researchers usually are revaccinated every three years. Survivors of smallpox may experience severe complications, including deeply scarred skin, blindness, arthritis, osteomyelitis (bone infection), and fetal infections during pregnancy resulting in additional severe complications or death of the fetus. Smallpox is one of the most communicable of all infectious diseases. Of those who are unvaccinated, smallpox has a 30% mortality rate. Centers for Disease Control and Prevention, "Smallpox"
World Health Organization (WHO), "Smallpox"
Skin lesions (day seven) on an unvaccinated infant. Reprinted with permission from Fenner F, Henderson DA, Arita I, et al: Smallpox and Its Eradication. Geneva, Switzerland: World Health Organization; 1988: 10-14, 35-36. Photographs by Arita. Ordinary form of variola minor smallpox in an unvaccinated woman 12 days after onset of skin lesions. Reprinted with permission from Fenner F, Henderson DA, Arita I, et al: Smallpox and Its Eradication. Geneva, Switzerland: World Health Organization; 1988: 10-14, 35-36. Photographs by Arita. Adult with smallpox (variola major) with hundreds of pustular lesions distributed with more on arms and face than on trunk. Fitzsimmons Army Medical Center slide file. Hemorrhagic-type variola major lesions. Death usually happens before typical pustules developed Reprinted with permission from Herrlich A, Mayr A, Munz E, et al: Die pocken; Erreger, Epidemiologic und klinisches Bild. 2nd ed. Stuttgart, Germany: Thieme; 1967. In: Fenner F, Henderson DA, Arita I, et al: Smallpox and Its Eradication. Geneva, Switzerland: World Health Organization; 1988: 10-14, 35-36. Variola represents a significant threat as a biological warfare agent. Variola is highly infectious and is associated with a high death rate and secondary spread. Currently, the majority of the U.S. population has no immunity, vaccine is in short supply, and no effective treatment exists for the disease. Two WHO-approved and inspected repositories remain: One is at the Centers for Disease Control and Prevention in the United States and the other at Vector Laboratories in Russia. It is widely believed that clandestine stockpiles exist in other countries such as Iraq and North Korea. Please describe your experience with smallpox. What smallpox treatment for your smallpox? Please describe your experience with the smallpox vaccine.